Heavy rain lashed the city throughout the night last night, creating a flood-like situation here. The Haryana government has decided to increase the number of members of the Haryana Public Service Commission (HPSC) from the existing eight to 12 besides the chairman to ensure smooth working of the commission. The Haryana government has issued the transfer orders of six IAS officers. The commissioner and secretary, Animal Husbandry and Dairying, Hardeep Kumar, has been given additional charge of commissioner and secretary, Archaeology and Museums, during the leave period of R. P. Chander. The government today issued the posting and transfer orders of 10 IPS officers. All nine accused in the kidney scam, including Dr Amit, Dr Jeevan, Dr Sarj, Dr Upender, Dr K.K. Aggarwal and nurse Linda, were produced in the CBI court of Special Magistrate Abdul Majid here today. The court adjourned the hearing till August 18. The Haryana power distribution companies today signed agreements with PTC and Adani Power to purchase electricity at a levelised tariff of Rs 2.86/kwh to Rs 2.94/kwh for the procurement of 1,724 MW of power for 25 years. The Haryana government has no objection if the proposed Chandigarh international airport is named after Shaheed Bhagat Singh as suggested by the Punjab government. Special court Judge Neelima Shangla awarded 10 years of rigorous imprisonment to a drug smuggler, Kuldeep Singh, here today. The Haryana administration is considering a proposal to reduce the fare of air-conditioned buses being plied between Gurgaon and Delhi to make it at par with Delhi. Haryana Roadways employees today resorted to a “chakka jam” for three hours here in protest against the lathicharge on fellow HR employees at Jind yesterday. The employees gathered at the workshop at 11 am and marched in procession to the main bus stand where they were joined by other colleagues. In order to register their protest against the failure of the district police in arresting those responsible for the murder of a 16-year-old girl, whose body was found in a local canal a few days ago, relatives and residents of her native village Sheikpur today held a silent procession in the city. In view of the Lok Sabha elections due in a couple of months, president of the Haryana Janhit Congress Kuldeep Bishnoi seems to have launched a massive campaign to woo the state electorate. In the past two days, Bishnoi organised three rallies at various places - Israna in Panipat, Taravari in Karnal and Babin in Kurukshetra. The Indian National Lok Dal (INLD) will organise a protest march against the “faulty” special economic zone (SEZ) policy of the Congress government in Delhi on August 9. The district authorities have decided to start e-stamping in the district from August 11. Three youths allegedly killed one of their fellow students by breaking his neck to settle a personal score here today. The police today arrested three persons with 69 kg of poppy husk near Dabwali town when they were trying to smuggle the contraband to Punjab. A 17-year-old girl was allegedly kidnapped from the Railway colony here yesterday by their tenant’s son, Arjun Singh, in collusion with his mother as well as a young girl residing in their neighbourhood. A number of programmes were held here today to mark the birth anniversary of late O.P. Jindal, former Haryana minister and Kurukshetra MP. Raj Kumar Verma (50), a senior Bharatiya Janata Party leader of the area, died of jaundice today. Heavy rain lashed the city throughout the night last night, creating a flood-like situation here. Three-fourths of the city was inundated and the district administration’s arrangements to deal with such a situation exposed. A woman and her 15-year-old son died when their house at the local Balaji Colony collapsed due to the rain. Four others sustained injuries in the incident and have been admitted to the local civil hospital. Earth reportedly caved in at several places. Water entered houses and business establishments at a lot of places in the city, causing huge loss to the owners. Water entered Vaish Model Senior Secondary School and Chetna Sadan on the Loharu road and costly goods and furniture, office equipment, including computers, reportedly got damaged. As many as 44 colonies in the city have been inundated and over 60 per cent of the population affected. Several canals passing through the district are running near the danger mark. 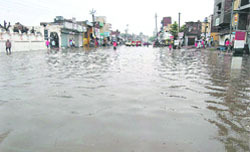 The Circular road in the city is flooded and the traffic has been badly hit. The administration does not seem to have a plan to deal with the situation. No rescue operations have been launched by it. Cracks have appeared in some houses while several kutcha dwellings have reportedly collapsed in several colonies. Though the the DC, the ADC and the SDM tried to visit several parts of the city, they could not reach most of the areas due to the water. The DC reportedly had meetings with officials and directed them to help the people. The DC also directed Red Cross officials to provide a financial help of Rs 25,000 to Nanu Ram, whose house at Balaji Colony in Dinod Gate collapsed due to the rain. Nanu Ram lost his wife Santra Devi and 15-year-old son in this incident. The district education officer has been directed to close schools till tomorrow in the city. SONEPAT: A downpour for nearly one hour on Wednesday evening and incessant rain on Thursday morning for more than two hours disrupted life in this town and resulted in waterlogging at several places. The worst-hit areas were Kakroi Chowk, Geeta Bhawan Chowk, Kalupur Chungi, the Old DC road, the Gohana road in front of Panchayat Bhawan, the Shani Mandir road and the Rohtak road where vehicles were stranded in 2 to 3 ft deep water. There were traffic jams at Kakroi Chowk, near Shani Mandir and on the Rohtak road near the Mission road. In many low-lying localities in the town, water entered houses. ROHTAK: Intermittent rain lashing the district and nearby areas of the region since Wednesday has thrown normal life out of gear and made residents face multifarious problems. Apart from flooding various streets and roads, the recent spell of rain also severely damaged the Delhi-Hisar National Highway No.10 and several other roads connecting Rohtak town to other districts. Hundreds of acres of agricultural fields in a number of villages of the district have been inundated by rainwater. Waterlogging in fields has affected standing crops of paddy, sugarcane, jowar and bajra. In some villages like Bharan and Ajayab, rainwater also accumulated in schools, due to which studies were affected. Water also entered several residential localities in low-lying areas of the district, especially the rural areas, causing extensive damage to houses. As per local sources, Ajayab, Bharan, Kharkara, Nindana, Muradpur Tekna, Bahalba, Madina and Mokhra villages in Meham block; Kalanaur town, Baniani, Patwapur, Lahli and Bhali Anandpur villages of Kalanaur block; Ismaila, Chuliana and Kharawar villages under Sampla block and several others in Lakhanmajra block of the district are among the worst-hit ones. In a statement issued here, deputy commissioner R.S.Doon asserted that adequate arrangements had been made for the disposal of rainwater from the low-lying areas of the district. Meanwhile, a team of the local unit of the Haryana Janhit Congress, led by Krishan Murti Hooda, visited Kalanaur to assess the situation. FATEHABAD: Standing crops on hundreds of acres in Gorakhpur village in this district have been submerged under 2 to 3 ft of water due to intermittent rain in the area for the past five days. Streets of the village have been waterlogged. Villagers said if immediate steps were not taken to remove water from the village, the loss would be irreparable. Sources said the decision to expand the HPSC was taken “in anticipation” of the suspension of its nine members, including the HPSC chairman, following a nod to a presidential reference by President Pratibha Patil. A decision to this effect was taken at one of the shortest meetings of the state Cabinet which met under the chairmanship of Chief Minister Bhupinder Singh Hooda here today and lasted five minutes only. The increase in the number of members has been made by suitably amending the regulation concerned of the Haryana Public Service Commission (Conditions of Service) Regulations, 1972. The increase in the number of members means that even if the present nine members, including HPSC chairman M.S. Saini, all appointed by the previous Indian National Lok Dal government, are suspended shortly, as is expected, the work of the HPSC will not come to a halt. With this expansion getting the nod of the cabinet, the government will hurry up with filling the newly created vacancies to carry on with the appointment process even when the present incumbents are suspended. The sources said the new appointments to the HPSC would be made within 10 days while the suspension of the HPSC members against whom a presidential reference was made in 2006 would be executed immediately after the receipt of papers. Meanwhile, sources in the Governor House, Haryana, said documents pertaining to the nod given by President Pratibha Patil to a presidential reference sent by the Haryana government for removal and suspension of the members of the HPSC had been received. While as of now only information has been forwarded to Governor A.R. Kidwai, who is at present in Delhi, related documents will follow shortly. With the reference being sent to the Supreme Court for investigation of charges of misbehaviour by members, as maintained by the government, the Governor can now suspend the members till the time the inquiry is on. The members can be suspended till the President passes orders on receipt of the report of the Supreme Court on such a reference. The government had made a presidential reference in 2006 seeking removal and suspension of the members of the HPSC on grounds that their appointments were not in consonance with the guidelines. The government had maintained that the Om Prakash Chautala-led government had made fresh appointments in 2004, just before going out of power, to “remote-control” the HPSC even while it was out of power. The President had given her nod last week after which the reference will now be sent to the Supreme Court, the only competent authority for carrying out an inquiry into the working of any public service commission, for investigation into the charges of the government. The Haryana government has issued the transfer orders of six IAS officers. The commissioner and secretary, Animal Husbandry and Dairying, Hardeep Kumar, has been given additional charge of commissioner and secretary, Archaeology and Museums, during the leave period of R. P. Chander. Deepti Umashankar has been posted as deputy commissioner, Gurgaon, and chief administrator, Shree Mata Sheetla Devi Shrine Board, Gurgaon, in place of Rakesh Gupta, who has proceeded on study leave. C. R. Rana is the new deputy commissioner of Palwal. He takes over against a newly created post. Rajiv Ranjan has been posted as deputy commissioner, Mewat, at Nuh. O. P. Sheoran, deputy commissioner, Fatehabad, has been posted as deputy commisioner, Hisar, and J. S. Ahlawat as deputy commissioner, Fatehabad. S.C. Sinha has been posted and transferred as DG, OSD (Rules), in place of Brijinder Rai, whose posting orders will be issued later. V.B. Singh has been posted as director, State Vigilance Bureau, while V.N.Rai is the new ADGP, Law and Order, with additional charge of director, HPA, Madhuban. Anil Dawra will now hold the charge of IG, CID. M.S. Mann, IG, Prisons, and R.C. Jowel, IG, Home Guards, will swap their places of posting. Similarly, Sudhir Mohan has been posted as IG, SVB, and M.S. Ahlawat goes as IG, Operations, and O.P. Singh as director, Sports. The court discharged two of the accused in the case, as their names were not mentioned in the chargesheet filed by the CBI. The court had already granted them bail. The CBI did not raise any objection to it. The accused, Ramesh and Suresh, had been working as cooks in Dr Amit’s hospital in Gurgaon. The CBI filed three applications in the court today while the defence counsel filed two more applications. S.D. Singh and Amit Gupta appeared as defence counsel in the court. The CBI filed an application for the attachment of immovable property of Dr Amit and a few other accused. In the application, the CBI mentioned a list of 12 residential and commercial properties of Dr Amit in various posh colonies of Gurgaon worth crores. Similarly, a list of 11 properties of Dr Upender in Faridabad and Ballabgarh and a list of two properties of Dr Jeevan were mentioned in the application. The CBI, in another application, has disclosed an account of Dr Amit in HSBC Bank, Hong Kong. The CBI claimed that $58,000 were lying in this account. It requested the court to freeze this account. The CBI filed a second application for issuing a letter to the judicial authority in Canada through the department of justice so that the CBI could carry out investigation pertaining to some persons there associated with the kidney scam. The CBI added that Dr Amit had shifted his wife Poonam and his two sons to Canada. The defence counsel filed two applications in the court, in which he requested the court to release the cease property of Dr Amit in DLF, Gugaon, and also release his bank accounts. The Haryana Power Generation Corporation (HPGCL) also signed a share purchase agreement with CLP Power India for the procurement of 1,320 MW for 25 years. CLP Power India will set up a 2 x 660 MW mega-status thermal plant in Jhajjar district. All agreements were signed in the presence of Chief Minister Bhupinder Singh Hooda here today. Hooda said with the signing of these agreements for 3,044 MW of power, the state would cross the milestone of the targeted additional 5,000 MW as now its capacity would exceed 6,000 MW. He said the entire process was duly approved by the Haryana Electricity Regulatory Commission (HERC). Adani Power will be supplying 1,424 MW from its imported coal-based project being set up in Mundra (Gujarat) at a levelised tariff of Rs 2.94/ kwh on the Haryana periphery. It will lay dedicated transmission lines from Gujarat to Haryana. PTC, which is a leading power trading company in India, will supply 300 MW at a levelised tariff of Rs 2.86/kwh from the power project being set up at Kamalganga (Orissa) by the GMR. Hooda said for next three years, one power plant would be commissioned every year to add to the generation capacity of the state. Complimenting officers of the power utilities on today’s agreements, Hooda specifically appreciated the efforts made by two officers, P.K.Dass, former MD, Haryana Vidyut Prasaran Nigam, and Jyoti Arora, former MD, Haryana Power Generation Corporation, in this regard. Haryana power minister Randeep Singh Surjewala said the state was now moving from power deficiency to power sufficiency. Stating this here today Haryana Chief Minister Bhupinder Singh Hooda said he had no objection to this name because Shaheed Bhagat Singh was a national hero and belonged to the entire country. The next session of the assembly is likely to be held in the first or second week of September. She also imposed a fine of Rs 1 lakh on him. In case of default of payment of fine, the accused will have to further undergo a three-year imprisonment. The police had seized 70 kg of poppy husk from Kuldeep’s possession after raiding his house at Gumthala Garhu village on December 4, 2006. The accused was arrested under Section 15 of the Narcotic Drugs Psychotropic Substances Act. Shangla in her judgment observed that sale and purchase of narcotics had spoiled the lives of the youth. Haryana transport minister Mange Ram Gupta stated this while inaugurating the City Bus Service in Gurgaon today. Air-conditioned Volvo buses named “Sarthi” were being plied from Gurgaon to Chandigarh passing through Delhi. He said at present 10 modern semi-low-floor buses were being plied for the City Bus Service and nine more would be added to the fleet of 10 in the next week. A total of 19 such buses would ply on the local routes in Gurgaon. Haryana Roadways employees today resorted to a “chakka jam” for three hours here in protest against the lathicharge on fellow HR employees at Jind yesterday. The employees gathered at the workshop at 11 am and marched in procession to the main bus stand where they were joined by other colleagues. They raised slogans against the police and the government. Addressing the protesters, roadways’ employee leader Dalbir Kirmara said they had been seeking redressal of their grievances since long but the transport minister was not prepared to listen to them. Criticising the minister, he said it was ironical that he was handling transport and education ministries and employees of both departments were agitating for their demands. He said the employees would continue to protest till their demands were met. These included purchase of 8,000 new buses to strengthen the fleet, recruitment of staff and an end to the privatisation and contract system. Normal bus services could be resumed around 2 pm after the protesters left the bus stand and employees joined their duties. JIND: The bus services of Haryana Roadways remained paralysed for three hours on Thursday as employees resorted to a “chakka jam” from 11 am. The entrance and exit points to the bus stand were blocked and employees assembled here to stage a demonstration. They raised slogans against the government and the transport minister and demanded his resignation. “The transport minister has no moral right left to remain in office after hundreds of employees became a victim of police brutality on Wednesday,” said a spokesperson for the union. State president of the union Baldev Singh Ghanghas condemned the police action and demanded suspension of the officials concerned. 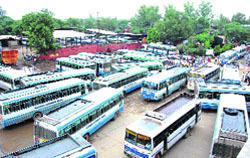 FARIDABAD: Roadways’ staff staged a three-hour strike at the Ballabgarh bus depot. No bus moved out the depot during the strike. Commuters were put to great inconvenience. Employee leaders said they were in touch with various employee organisations at the national level and would observe a strike on August 20. SIRSA: Bus services in the district remained paralysed between 11 am to 2 pm. Roadways’ workers parked their buses haphazardly in the local bus stand at 11 am and no bus was allowed to move for three hours. The workers assembled at the bus stand and raised anti-government slogans. FATEHABAD: Roadways buses went off the road at 11 am, giving a harrowing time to the commuters. Employees assembled in the bus stand and held demonstration against the government. The protesters demanded that the person who had killed 16-year-old Sushma must be arrested. Sushma, who was a student of class X, had gone missing on the night of August 1 under mysterious circumstances. On August 4, one of the villagers informed her family that some of Sushma's belongings had been found on the banks of the Avardhan canal. Family members and some villagers reached the spot and started looking for Sushma. Though they found a piece of cloth worn by Sushma the day she went missing, they could not find her. Sushma's body was later found floating in the canal. Sushma's father, Ram Singh, alleged that his daughter had been killed by Rajinder Singh, a native of the village, who had been making advances to her for several months. After her body was found, the family approached the police and sought the registration of a case against Rajinder Singh. They refused to get a postmortem conducted at the local hospital, following which the body was sent to a Rohtak hospital for the purpose. Later, the body was handed over to the girl's parents, who brought it here, but refused to perform the last rites till appropriate action was taken against the guilty. Ram Singh said all he wanted was justice and till it was delivered, he would continue the protest. Meanwhile, the district police maintains the matter is still under investigation. Speaking at Israna yesterday, Bishnoi accused Congress president Sonia Gandhi of betraying people of the state by letting Chief Minister Bhupinder Singh Hooda run the affairs of the state instead of Bhajan Lal. He said the state had registered a gigantic progress under the rule of the Congress party when Bhajan Lal was the Chief Minister. People of the state had voted for the Congress believing that similar progress would be made. However, the Hooda-led Congress government had dismayed the electorate. At Taravari today, the HJC president said he was not against the N-deal, but was against the Congress and its policies. Addressing a public meeting at Babin here today, he promised that if voted to power, his party would serve the people with the right kind of policies so that the state could be made the number one in the country. He also assured the gathering that the HJC would evolve new means to generate more employments for the youth of the state. He promised to give employment to one member of each family within a year after coming to power. INLD secretary-general and Rajya Sabha MP Ajay Singh Chautala will lead the protest to be organised on Quit India Day at Jantar Mantar, near Parliament House. In a statement issued here today, Chautala claimed that thousands of affected farmers from the districts of Gurgaon, Faridabad, Jhajhar and Sonipat would participate in the protest march. Announcing this here today, deputy commissioner V. Umashankar said the system, when started, would end the use of printed stamp papers for the registration of sale deeds of immovable property in the district. He said the buyer of property would have to deposit the requisite stamp duty in banks and his deed would be registered on the basis of the receipt issued by the bank. Umashankar said e-stamping would bring about transparency in the registration of deeds. Sandeep (18), a student of class XII of Senior Secondary School at Kishangarh and resident of Sutana village, became the victim of personal rivalry over a trivial issue. Satpal, father of the deceased, said his son had picked up a quarrel with some youths belonging to the same village. He said his son had a fight with these youngsters yesterday and today they killed him out of vengeance. According to Satpal, his son left home in the morning to attend his school as usual. However, he reportedly went missing from the school after marking himself present. Later, two youths took Sandeep to a local nursing home, where doctors declared him brought dead. The youths, who were accompanying Sandeep, disappeared from there after telling the doctor that they wanted to make some call. After a while, the doctor got apprehensive and informed the police about the body. A team of police officials reached the nursing home and took the body into custody. The police found some phone numbers in Sandeep’s pocket, through which they got in touch with the victim’s family. The police has registered a case against Bhinder, Vikas and Arvinder of Sutana village on a complaint filed by Satpal. However, the arrest of the three accused could not be confirmed till the filing of the report. The body was handed over to Sandeep’s family after a postmortem examination at the local Civil Hospital. The accused tried to escape by hitting their vehicle into the police gypsy. However, they were nabbed by the police and booked under the Narcotic Drugs and Psychotropic Substances Act. They have been booked for attempt to murder too. According to police sources, Navtej, Angrez and Surender, all residents of Moga town here, were coming from Rajasthan in a Scorpio when they were signalled to stop by a police party headed by ASI Krishan Kumar. The police has arrested them under various provisions of the NDPS Act and Section 279 and 307 of the IPC. The girl’s mother, Indira Yadav, wife of late Daya Ram Yadav, received a call last evening from her “abducted” daughter, who reportedly informed her that she was in Delhi. Subsequently, Yadav made a complaint, following which the police has registered a case of abduction coupled with seduction and criminal conspiracy under Sections 363, 366 and 120-B of the IPC against the accused Arjun Singh, his mother Shashi Bala and Manisha. Deputy commissioner Vikas Gupta inaugurated a blood donation camp at Geeta Bhawan, in which 32 persons donated blood. Priyanka Gupta, wife of the deputy commissioner, inaugurated a gym at Senior Secondary School at Jakholi Adda here. She also garlanded a portrait of Jindal. A free of cost ayurveda medical check-up camp was held under the aegis of the O.P. Jindal Gramin Jankalyan Sansthan at Sherda village in Pai assembly constituency. Former sarpanch Sher Singh inaugurated the camp after garlanding the portrait of Jindal. As many as 328 persons were medically examined and provided medicines free of cost. At another function, Kurukshetra parliamentary constituency in charge Kulbhushan Goel visited the lepers colony here and distributed fruits to members of lepers’ families. R.S. Yadav, secretary to Naveen Jindal, honoured a number of persons, who had made outstanding contribution to sanitation campaign launched in the district. Verma became the first victim of jaundice in the town and with his death, the toll of deaths due to the recent spate of fever, malaria, viral and jaundice has reached nine at Tohana. Verma was the district secretary of the backward cell of the BJP and was president of the Swayam Sewak Sewa Mandal, an NGO working for improving sanitary conditions in the town. Ironically, he himself had to become the victim of poor sanitary conditions in the town. According to reports, Verma was suffering from jaundice for the past 20 days and was shifted to Delhi three days ago, when his condition did not improve. Verma died in a Delhi hospital today. Meanwhile, civil surgeon J.K. Bishnoi has claimed that cases of fever have witnessed a declining trend in Tohana town now. “Of the 362 patients that visited the out patient department of the general hospital today, only 124 were of fever,” he said. Bishnoi visited the affected localities of Tohana town today and has constituted six teams of para-medical staff to take blood samples of the affected persons from their respective areas. Talking to The Tribune, Bishnoi said the teams had been asked to camp at Bajrang School, the Vishwa Hindu Parishad office, Nirankari Bhawan, Gurdwara Banda Bahadur, Dera Sacha Sauda “satsang ghar” and Guru Nanak Public School. The civil surgeon said that over 1,800 blood slides of patients suffering from fever had been made in Tohana during the past one month, of which 36 had been found to be suffering from malaria. He confirmed three cases of dengue in Tohana.